My banner for this cluster balloon flight shows a rocket, arching to the heavens, alongside my cluster of helium filled balloons. This was the flight from Rocket City, Huntsville Alabama under a system of 66 helium inflated balloons, carrying me and my red armchair aloft above Alabama and Georgia. 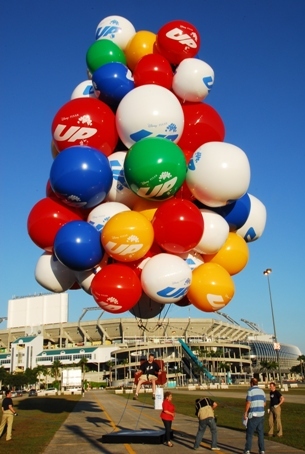 160 miles flown; 9 hours in the sky; manned flight to 14,000+ feet under colorful helium balloons. An uncommon way to see our world. From Caribou, Maine USA to Lark Harbor Newfoundland, Canada. 466 Miles, 318 over open water. Greatest distance ever flown by this type of aircraft. Largest cluster balloon system ever built. International flight, USA to Canadian province Newfoundland & Labrador. We had a tremendous, magnificent, beautiful flight when, on September 12th 2013, I made a trans-Atlantic attempt using the largest cluster of balloons ever assembled in the history of flight. I covered more distance than any other flight of its kind; no one has ever flown this type of aircraft this far. The world became our team for one day as we reached tremendous heights, and unparalled distances. I flew hundreds of miles and crossed the great Gulf of St. Lawrence. During that water crossing, I re-ran my ballast calculations based on actual ballast usage in the first 12 hours of flight, and compared that to the time I would be in the sky; all calculations told me I would make it so far-- 1,500 miles -- which means I would have to ditch mid-ocean. I could fly for so far... and then be forced to ditch into the water. Instead of ditching at sea, I crossed the 318 miles of the Gulf of St. Lawrence and I landed on the final piece of solid ground before the deep: the fearsome, but also welcoming, province of Newfoundland & Labrador. Two year of work came to this-- a magnificent inflation by the team in Caribou, Maine, then this uncommon flight-- with hundreds of miles flown, and many more as my goal. My heart could never live a long life the way it was beating that day. My heart would never last to old age, the way it was beating as I gave the GO message to the team, to meet at the airfield. We had this moment-- these ephemeral hours-- to stand this aircraft and to pursue the dream that has held me, and generations of dreamers, rapt for ages. Great distances, a great team, and a great aircraft-- we built the largest cluster of balloons ever assembled, dwarfing the cluster I used to fly a house. 366 individual 8-foot balloons lifted me and my yellow boat into the skies for 466 miles before putting down in Newfoundland, just inland of the 1,000 foot cliffs that rise up out of the gulf. We dream of going further. We dream of going again. We dream of the great Atlantic Ocean. Hope springs eternal. "What a coincidence- we both landed in trees! But my trees were much more friendly and more accessible to civilization.."
-Aviation Legend Col. Joe Kittinger, only person to ever cross the Atlantic solo in a gas balloon from the USA. 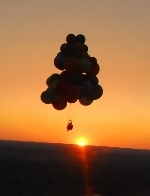 "Commiserations to Jonathan Trappe, who has abandoned his UP-style cluster balloon crossing. I know how you must feel!" -Iconic Brit Sir Richard Branson, who crossed the Atlantic in a hot-air balloon complete with rough night landing into the Irish Sea. A map of the flight via the sat tracker here. A map of the flight via the 2-meter HAM radio tracker here. So many times we have gone aloft this way. And why? Am I beyond talking about the silent beauty of this form of flight? Can I stop for now, and talk instead about WHY we do it at all? For the first flight, it was to seek a new adventure, in a new direction-- to find genuine adventure, even in our modern times. Ok, but I've talked about that before. Why do I do it now? Is there anything to be proven? No; I've never done it to prove anything. I can fly these toy balloons-- in manned flight. It is difficult. Have I ever said that? The balloons are so hard to get to the point that they are flying. Logistics. Organization. Weather; it dropped to 24 degrees during the 5-hour inflation. It was -2 degrees at altitude. Unreasonable drive to cause it all to happen. Yes, it is all unreasonable. And why? Well, I've said it already, haven't I? To live an interesting life. Oh, and it is an interesting life. Flying this Japanese TV star, for a prime-time program to be viewed by some 15-million viewers in Japan. 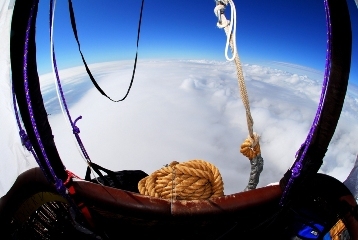 Flying to 18,000 feet-- in an open wicker basket. It was 24-degrees on the surface, as we inflated for 5 hours. I said that already. But, then-- from there we went up, to altitude, and lived that day in the sky. And why? To live an interesting life. For me, that's enough. That is the reason now, today, that I fly these systems. To experience the sky-- yes, certainly. But, in the end-- to live a life that is something I will reflect upon, and I myself will find interesting. France! Italy! Crossing The Alps! Launching into manned flight above the storied mountains of France... with toy balloons! This is serious topography. The Alps. Hannibal crossed on his way to attack Rome, and he made the crossing with war elephants. I go for a far less hostile reason, though not necessarily with a more practical mode of transportation. His trek was arduous. I yearned for a more serene experience, though I prepared for many possibilities. Am I allowed to admit some trepidation? This is the ALPS! Good luck and good allowed me to launch right in base of the mountains, in Gap/Tallard France. From there, I cast myself into the sky, and I rode the wind. I floated above Earth, in this majestic region, in the country that first hosted manned flight over 225 years ago, with spectacular visions real and imagined. 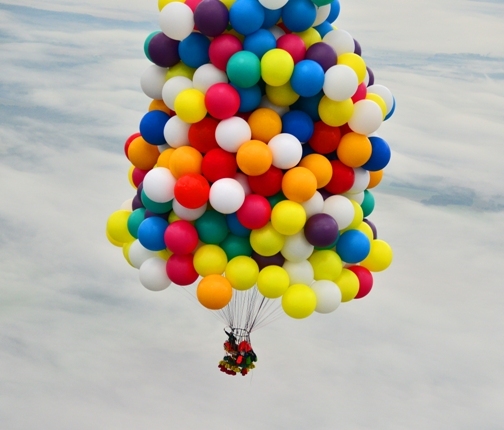 A tower of colorful helium filled balloons carried me into the skies, to destinations unknown and undreamed at launch. A little balloon, and me. 102.3 miles. 11.9 hours. France. Italy. The Alps. Such great adventure in the open skies. The National Geographic Society has sponsored some of the greatest human expeditions of all time. It is a tremendous honor to see photos of our flight (and my aircraft, the flying house N878UP), graced with that classic logo- the yellow portrait frame that adorned magazine covers so many of us gazed at in wonder throughout our childhood, and throughout our lives. I'm in the window, waving goodbye as we launched the house-- heading to 10,500 feet in manned flight. 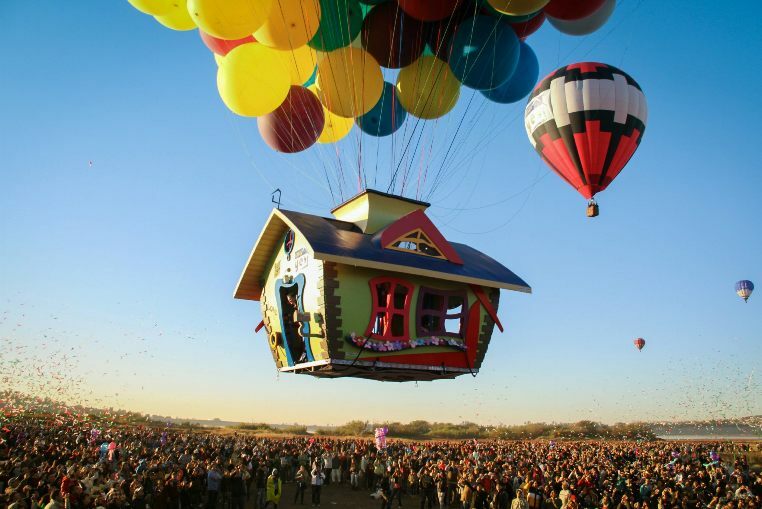 Our flying house aired on the NatGeo Channel worldwide. Bridging the gap between dreams and accomplishment! 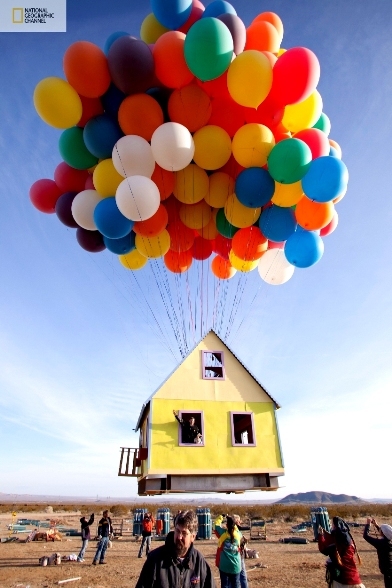 "A HOUSE RAISED WITH 300 HELIUM-FILLED BALLOONS. 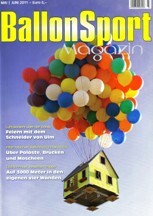 On Saturday morning, March 5, at dawn, a team of scientists, engineers and two world-class balloon pilots" [uh, I suppose they're talking about us] "successfully launched a 16' X 16' house 18' tall with 300 8-foot colored weather balloons from a private airfield east of Los Angeles, and set a new world record for the largest balloon cluster flight ever attempted. The entire experimental aircraft was more than 10 stories high and reached an altitude of over 10,000 feet and flew for approximately one hour.The footage will be part of a new National Geographic Channel series called HOW HARD CAN IT BE? Celebrating the Bicentennial of Mexico! 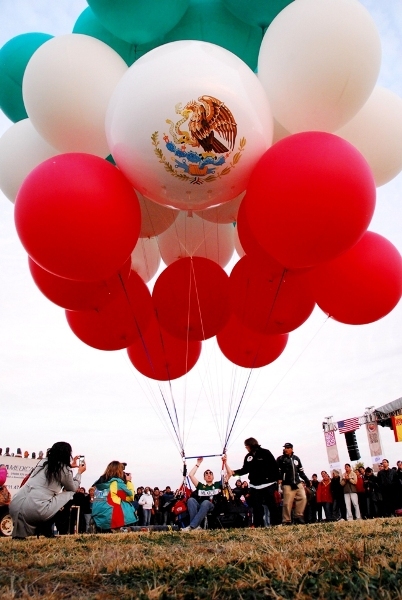 The Eagle Soars:Centered amidst the three-tiers of balloons, among the the colors of the national flag, sat a giant balloon emblazoned with the Great Seal of Mexico! This cell was larger than any other cluster balloon we've ever made. 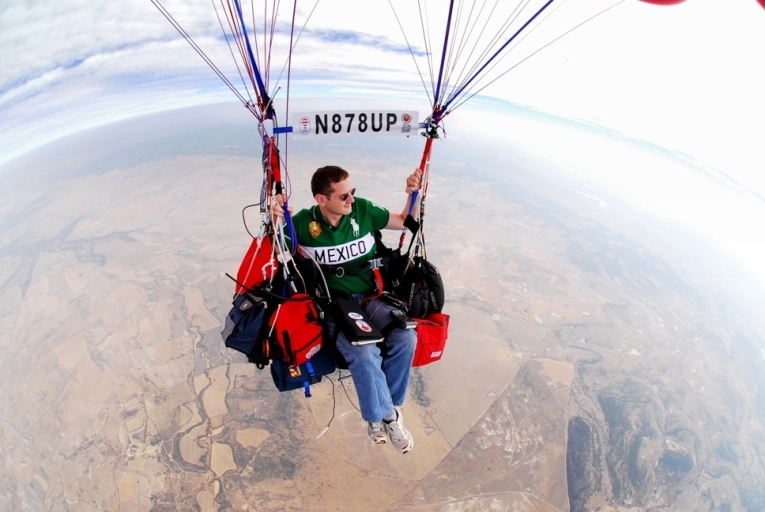 The Great Eagle of Mexico soared proudly into the skies above its native land! The Great Seal of Mexico-- the Great Eagle-- aloft in the blue skies of Mexico! In honor of the bicentennial, this cluster balloon system has been named "La Independencia" For over 8 hours, pilot Jonathan Trappe was carried aloft, up to 18,000 feet, by the great eagle towards destinations unknown: true adventure, even in our modern times! Among those with a passion for aviation, Oshkosh is special. The event, like our chosen form of flght, is unique. With friends, colleagues, and aviation enthusiasts from around the world, we launched our cluster balloon systeim above that storied event, embarking on an a 12.5-hour journey that would see the sun set on our cluster system while it still traveled the sky, a three-quarter moon rise while we floated the heavens 2-miles above Lake Michigan, silence in the dead of night when we had over 40 miles to any shore, and a sunrise greeted from the sky as we made landfall again, having rode the winds for 230 miles, traversing the skies for more than 100 miles of open water. All at the storied event know as Oshkosh, AirVenture, 2010. It is such a classic challenge, isn’t it? That iconic ribbon of water separating the UK from the continent has called to aviators for generations, tempting them to cross since long before you or I were born. Bleriot crossed in 1909. Bryan Allen in 1979. Yves Rossy crossed in 2008. Yost & Piccard made it; John Jeffries and Blanchard floated through the air above that tiny arm of the Atlantic earlier than anyone. And here it is, the English Channel, continuing to call to us. Perhaps it is a siren’s song, or perhaps crossing that ribbon of water is like breaking the ribbon at the finish line. Either way, there is an adventure to be had. Yes, for us, today, there is genuine adventure, even in our modern times. 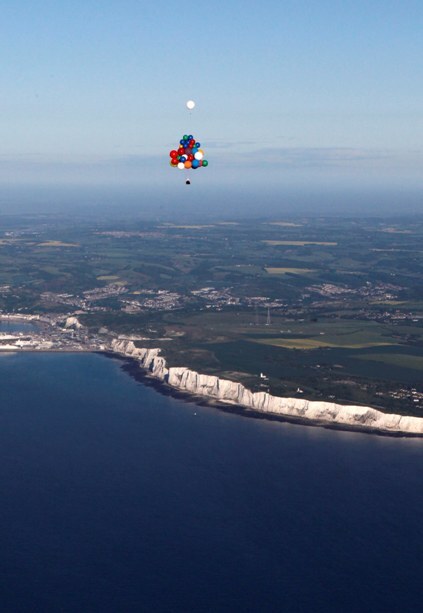 On May 28th, 2010 Trappe crossed the English Channel– floating in complete silence from the UK to the continent under a giant cluster of toy balloons. 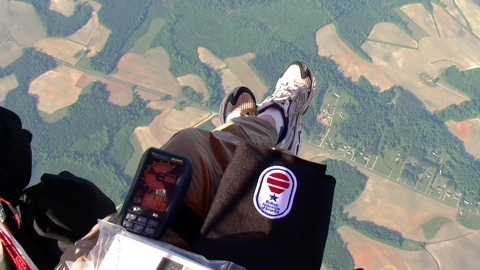 In early April, 2010 we completed a full-scale cluster balloon flight as I attached 57 balloons to a small harness and floated into the skies above North Carolina. After personally sampling the winds up to 7,500 feet, I verified that the weather forecasts were indeed correct, and I made the decision to attempt to survive the night. I deployed my night aviation lights, and floated into the quiet skies. The sun set, and I wouldn't touch the earth for another dozen hours. With permission from air traffic controllers, I floated into the skies above my home city of Raleigh; working with the RDU tower controller (who helped maintain safe separation from other aircraft) I floated about a mile above my city before the winds shifted and carried me back to the countryside. I flew for 14 hours non-stop, through the dark of the night, and welcomed the sunrise from the sky. Can you imagine, seeing the sunrise while floating a mile high in complete silence? It was indescribably beautiful. It was also a very welcome sight; it had been below freezing through the night, and I was very grateful for the return of the sun. It also meant that we had made it through the night. Thank-you to my dedicated crew, the Wings of Carolina Flying Club, the Sanford Lee-County Airport, and the air traffic controllers at RDU airport. Thank you to our friends at the Experimental Aircraft Association; The Spirit of Aviation is alive! This is a unique form of flight, and it was a tremendous pleasure to share the skies. In the Disney Pixar film 'UP!' 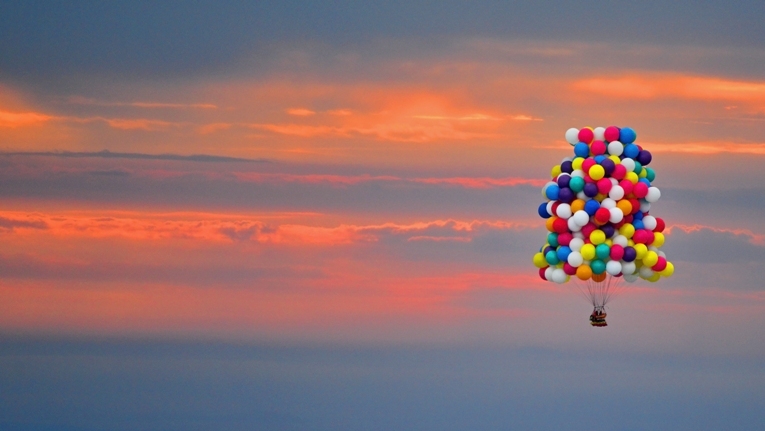 Carl Fredricksen (the 78 year old retired balloon salesman and active dreamer) attaches hundreds of balloons to his house, and floats off into the skies. This Pixar fantasy flight bears a remarkable resemblance to the cluster balloon systems we fly in real life. They fly a house, we fly a pilot! In fact, when you see the film you will notice that Carl Fredricksen has a favorite chair-- a comfy old red armchair that he relaxes in after his house takes to the skies. Well, we have built a real-world flying armchair based on this design. Disney/Pixar provided us full digital rotations of Carl's chair, and we created it in the real world to fly under an amazing 5-story cluster of helium balloons. Perhaps the flying chair is Carl's early design prototype: first the chair, then the house! 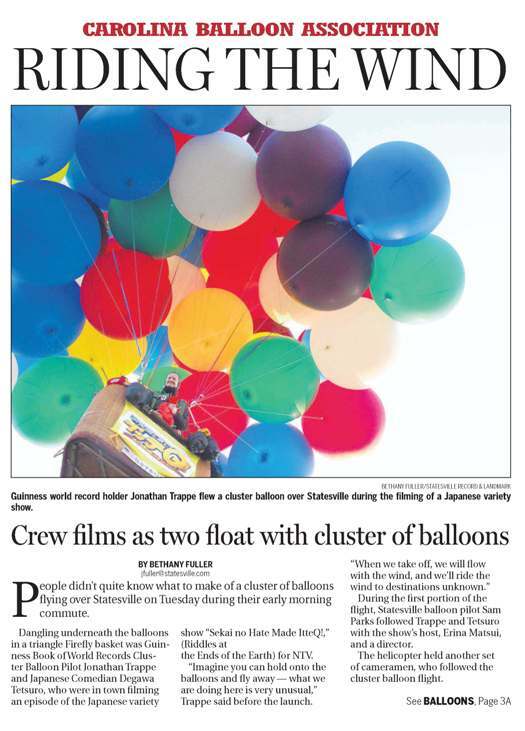 What a great time to be a cluster balloonist! This #1 film creates a great opportunity to delight festival and airshow audiences by hosting a real world cluster balloon flight. The film tells a truly delightful story, and connects with audiences around the world. If you run an event, and would like to send a cluster system aloft, please see the Appearances page so we can go UP! 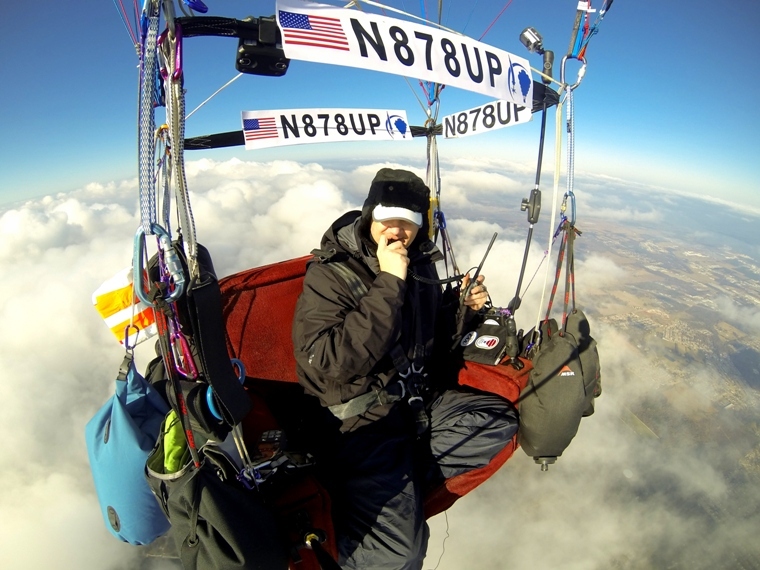 FAA Licensed pilot rated to fly hot-air and gas balloons. All flights flown in strict compliance with all Federal Aviation Regulations. 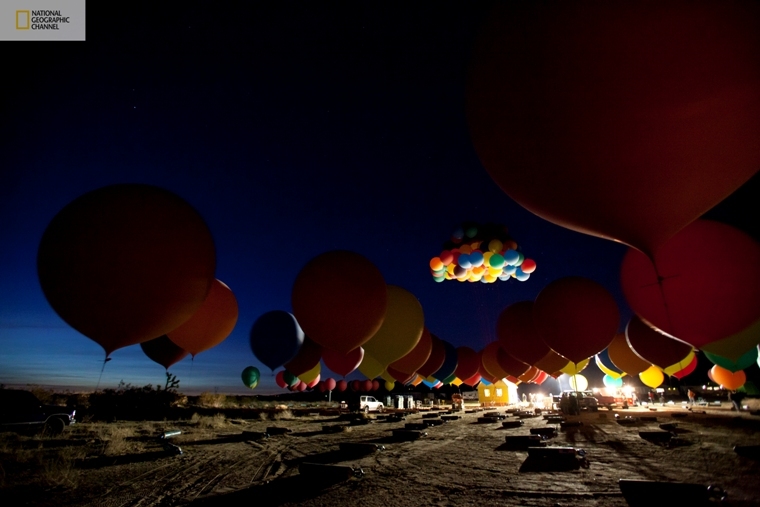 AMERICA'S CHALLENGE: Successful launch of long-distance manned helium balloon from Albuquerque, New Mexico! Flight of "Rainbow in the Dark" sets new America's Challenge race duration record, claims 2nd place in distance race! Balloon flight out of Albuquerque New Mexico piloted 1,214 miles over New Mexico, Texas, Oklahoma, Kansas, and Nebraska before crossing the Missouri river and descending for landing in Iowa! Flight details in full debrief page! 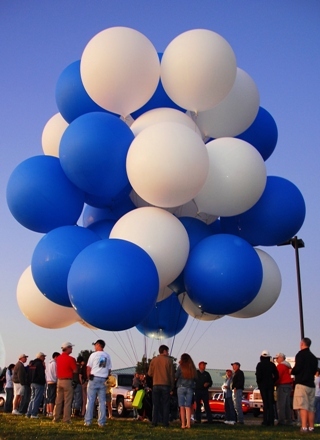 For almost 10 hours on August 31st 2008, the skies over Indiana played host to a giant 'Blueberry Cluster' of 38 helium balloons, piloted by Jonathan Trappe. Thanks to the Marshall County Hot Air Affair, the Blueberry cluster achieved an altitude of 17,930 feet-- a personal record for Mr. Trappe, and within throwing distance of the World Record. 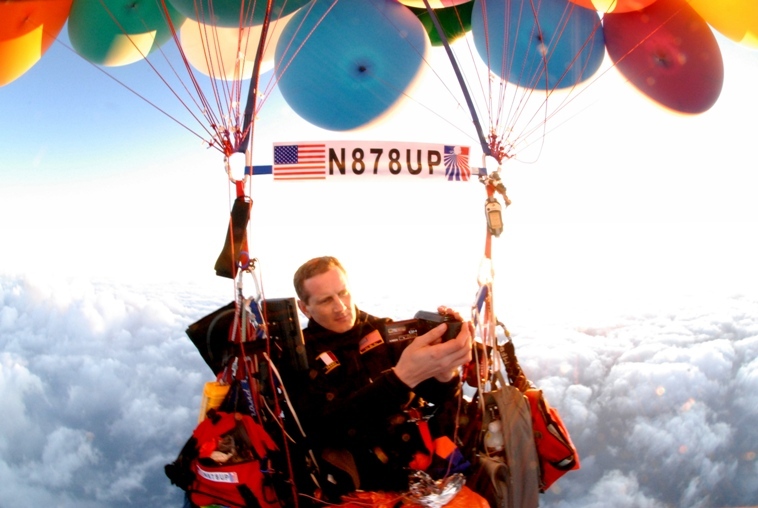 Trappe stayed below 18,000 feet to maintain strict compliance with FAA regulations for this type of flight. The launch could not have happened without the wonderful volunteers who arose in the early pre-light hours in order to meet at the field at 4:00 am. [ ! ]Thank you all very much; we sincerely appreciate it. Special thanks goes out to the flight's two main sponsors: the helium provider All American Welding and the overall event sponsor the Marshall County Hot Air Affair! It was the MCHAA Board members that made the flight happen. Jim, Ron, Cecil: thank you for the wonderful opportunity to fly in Plymouth. IMPORTANT: This flight was piloted by an FAA Certified pilot carrying appropriate safety and emergency equipment (transponder, aircraft radios, parachute, oxygen, etc.) Local and regional FAA air-traffic controllers were appropriately notified and the entire flight operated in strict compliance with all Federal Aviation Regulations. DO NOT attempt any ballooning activity without training from an FAA qualified instructor. Your life, and and the lives of those we share the sky with, depends on it. 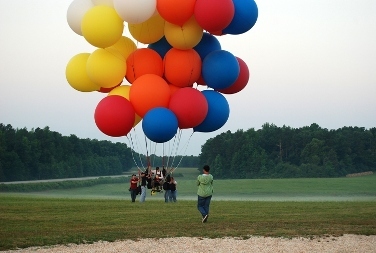 Early in the morning of June 7th, from an airfield in Franklin County North Carolina, Jonathan Trappe launched his standard, unmodified office chair under a cluster of 55 helium balloons, and took to the skies! The 4-hour flight attainted an altitude approaching 15,000 feet and covered a ground track of approximately 50 miles. The flight was equipped with a transponder, aircraft radio, parachute and a high-altitude oxygen system; the entire flight was conducted in full compliance with all Federal Aviation Regulations-- and was a tremendous success! Please join us to relive the flight!